“I now challenge you (Obasanjo) to search your soul, very deeply, and swear to this nation that you never awarded oil blocks in return for sexual gratification. Nobel laureate Prof. Wole Soyinka, calling former President Olusegun Obasanjo, a degenerate, liar, predator and sadist, has challenged him to swear whether he never awarded oil blocks in return for sexual gratification while he presided over the affairs of Nigeria. 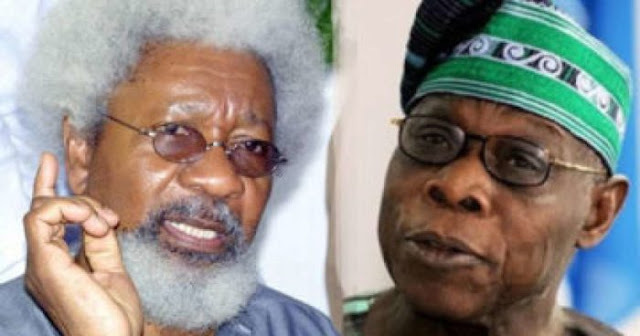 Soyinka and Obasanjo Soyinka spoke in his Interventions VIII series, titled: ‘Quis Custodiet Ipsos Custodes?’ meaning “Gani’s Unfinished Business,” launched recently in Lagos, Southwest Nigeria. He said Obasanjo knows him so well that he does not make accusations lightly and that he despises snide insinuations. “If I denounce you (Obasanjo) as a degenerate in need of help, remember that I do not require fiction. Verifiable truth is solemnly at my disposal. I do not concoct a thousand snipers for a thousand listed enemies of governance-one of the most impudent egregious fantasies ever manufactured by a former ruler, simply to destroy a successor and persuade oneself that one is a maker and breaker of governments,” he said. Soyinka also said that during Obasanjo’s celebration of the 10th anniversary of his Presidential library, the former president accused him of blocking his ambitions to become the Secretary-General of the United Nations. Soyinka also said that under Obasanjo’s watch, and with proven collaboration, an elected governor was kidnapped, locked in a toilet and held there under duress to force him to sign cheques on the state treasury, saying that “he escaped confinement, thanks to a sympathetic policeman, but the state went up in flames. The state radio and television houses were torched. The House of Assembly and the law courts—my own special preserve-were vandalized. Who did you say was President at that time?” Soyinka made reference to a letter written to Obasanjo by Col. Abubakar Umar, in which the former military governor accused Obasanjo of awarding oil block indiscriminately and illegally.